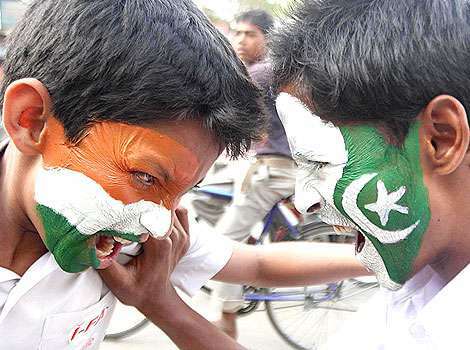 On 15 February 2015, when two of the fiercest cricketing nations were putting all their blood and sweat to win glory for their nation – which is what sport is meant to do, unless one thinks that this animal instinct is harmful to the human psychological growth – some of the great minds in India were preparing apology drafts for Pakistanis so that world peace is not disturbed by a few howzzats. It is a well-known fact that India and Pakistan share “special relationship” in the real universe as well as on the internet created the virtual universe. The nature of interactions, especially during cricket matches, crosses all the limits of expected social demeanour. It may be unfortunate, but that’s where the fun lies: we would be living in a fool’s paradise if we expect supporters of India and Pakistan to cheer their rivals in Lucknowi Tehzeeb and praising their nazaakat and shaili. The cross-border verbal firing was set weeks before the match started; it exploded on 15 Feb 2015. The debris of this explosion dispersed entertainment, satisfaction, sorrow, an apology. The apology part of this whole saga tickled me the most because I was eagerly waiting for the Don Quixotes of social media to glorify their battles against imaginary windmills. Though there were many protagonists, the Buzzfeed India editor Rega Jha stole all the ovations. In fact, she exceeded my expectations with such grandeur that I was caught in a Catch-22 situation – to bang my head on thoughts floated by her or to ignore her ploy of forcing me to bang my head. When I saw that many liberal, tender-hearted, intellectually grown people are taking a stand for her and questioning people who were questioning Rega Jha, I decided to bang my head instead of leaving the topic like an escapist. I am not sure why the prophetic Ravi Shastri’s style, “no matter who wins, cricket is the winner” was forcibly morphed by embedding it with “ugly Indians” part, which can only be justified by UFO riding aliens or fake-seculars, but I was amused to read that Rega Jha was among those selective out-of-the-box-thinkers who were watching the match to evaluate hotness of Pakistanis and Indians. The upcoming talented journalist who discriminates people based on their physical appearances left a silly comment, which was enough to provoke people whom she termed “ugly” (She could have just ended with calling Pakistanis hotter), but when people started rebutting, she picked selective comments to play her victim-card and to further prove how right she was in terming Indians “ugly”. And her trick worked. From being someone who cracked a silly joke that reinforced racial stereotypes about beauty, she became the victim of misogyny. The Huffington Post wrote a post on the Rega Jha incidence in which they say, “Buzzfeed India Editor Comes In For Vicious Sexist Attack On Twitter”. The outburst against Rega Jha was well exploited by her to gather publicity, but the more unfortunate part was a sudden upsurge of lazy intellectuals who started standing in her support saying it was just a “joke”. Well, the same intellectuals gang up and write editorials when Chetan Bhagat cracks equally silly jokes. Remember this outrage when Chetan Bhagat cracked a really old and lame joke on Father’s Day? If they can criticize Chetan, why should they defend Rega? They ganged up to defend their own, as Rega Jha is supposed to be a “liberal” while Chetan Bhagat has not earned that coveted label. And as if on cue, Rega Jha did what a jazzy intellectual would have done. With “ugly” nationalism and jingoism over, she moved to misogyny and patriarchy in India. Very “liberal” topics. She is correct in stating that the Social Media is hostile to women, but she was not “attacked” for being a woman. Not even for calling Pakistanis hotter (by the way women are treated in a really hostile manner by many “hot” Pakistani men). But for terming an entire group of people “ugly”. Let me be honest. Yes, most of us on the social media face criticism and abuses for putting opinions, whether the opinions are silly or serious. My facebook page (Bhak Sala) has 550,000+ subscribers and I get 100s of messages in which I am referred as AAPtard, ModiTard, IslamoPhobe, Sickular, Naxal, etc. I used to react to abuses in the past, but now no more. People grow by accepting, tolerating and/or ignoring these attacks. It is a personal choice. Rega Jha can either choose to ignore or play the victim in future. My bet is on the latter, as she will always find support for her jokes and stupidity because somehow she has earned the label of being a “liberal”.